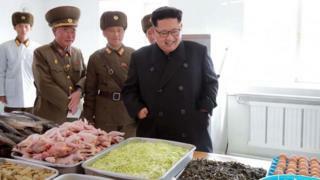 Speculation over North Korean leader Kim Jong-un's apparent weight gain has been a source of growing fascination in neighbouring China, where government censors have been blocking offending nicknames on social media. The terms "Kim the Fat" - and variations, such as "Kim Fat III" or "Kim Fatty III" - have appeared on social media sites throughout the year, particularly on China's most popular platform, Sina Weibo. But in response to unverified reports that North Korea had asked China to stamp out the abuse, Weibo users have been coming up with more creative names. The latest to appear online - and it doesn't translate easily - is "Kim III half-moon". The "third" in the title refers to the fact that his late father and his revered grandfather were also called Kim. The reported North Korean intervention has also piqued the interest of other users, with the various nicknames continuing to appear in the top 10 of censored searched terms on the platform, according to monitoring website Free Weibo. Popular Chinese media outlets have also started to censor users' comments that include the nicknames on their platforms. The terms are now fully censored on China's leading search engine Baidu, and a Weibo search returns the following message: "According to relevant laws, regulation and policies, search results are not displayed." Whether reports of the supreme leader's preference for Swiss cheese, scallops and whiskey are to be believed, pictures of Kim have shown a visible weight-gain since he succeeded Kim Jong-il in 2011. The South Korean National Intelligence Service claimed he has gained 40kg in four years. The censorship of names has prompted Chinese mainstream media to speculate that the order came directly from government officials - on both sides of the China-North Korea border. Hong Kong's Apple Daily newspaper said "the North Korean authorities have formally demanded that media, government officials and people from the mainland must not address leader Kim Jong-un in the future as 'Kim the Fat'". Meanwhile, the nationalist Global Times newspaper warns against "ridiculing" North Korea and says that social media users should have "respect for the leaders of neighbouring countries" and treat them with "graceful manners and self respect". Blog by Stephen Fottrell, with additional reporting by Ruhua Xianyu and BBC Monitoring.